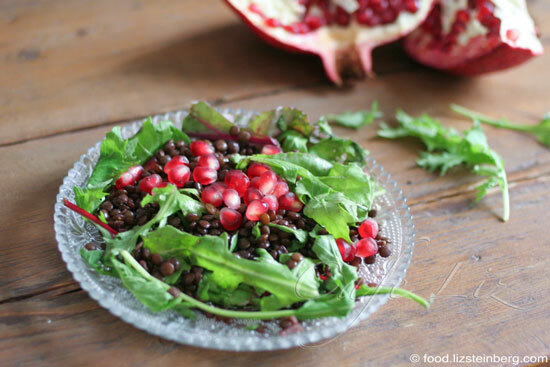 Little pomegranate jewels poke out from a jumble of shiny black lentils, resting on a tousled bed of greens — a lovely light meal that couldn’t be easier to prepare. And seasonal, too. It’s been a long few months — too long, perhaps, as this is the longest I’ve ever gone without posting. Hectic to say the least, with intensive work followed by a trip to the United States, accompanied through it all by my ever-growing baby boy. Visiting the United States generally makes me crave food from Israel, since most of what I’m eating while on vacation is rather standard American fare — processed flour and sugar, empty calories, very little fiber and lots of animal-based protein. Yeah, I know that you can get better food than that, and we did have some great stuff (pho! home-baked pizza! Tex-mex!) but this trip was more about visiting people than about eating, and when schlepping around sometimes you just have to make do with what’s available — and what’s available is often just average. Fast food and simple restaurants generally means meat sandwiches with lots of mayonnaise. Not falafel or hummus. Anyway, one of our better meals was at Le Pain Quotidien with a dear friend in New York, where we had a much-needed round of fresh vegetables and legumes, including a lentil-avocado salad with a dill vinaigrette on a bed of greens. 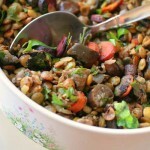 I like lentil salads. They’re also easy to make. I really should make them more often. So when I returned home and we needed an easy meal, I whipped up a batch of black lentils seasoned with the rich, warm flavors of pie spices, wine and pomegranate molasses, and then mixed them with some pomegranate seeds — which have a different flavor than the molasses, and it’s the season, after all. The result was a dish that looked impressive but took very little work. After all, what more could you ask? To cook the lentils, put everything but the pomegranate molasses and balsamic vinegar into a pot and let simmer until the liquid has mostly evaporated and the lentils are soft. This should take about 10 minutes. 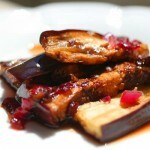 Then, stir in the pomegranate molasses and vinegar. To assemble the salad into four servings: Layer a handful of baby greens (about 1 cup, not packed at all), 3/4 cup lentils and 3/8 cup pomegranate seeds, and top with a swirl of olive oil (about 1 tablespoon) on a plate. Lightly toss so that some leaves stick up through the lentils and pomegranate. Repeat for the remaining ingredients. 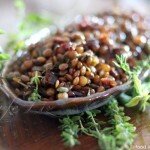 4 Responses to "Black lentil salad with pomegranate and baby greens"
I love lentil salads! The colors in this are just gorgeous. Agree, simple, healthy delicious – the best.